With technology becoming more sophisticated, shouldn’t you be using your surveillance system as a management tool? Are you still spending expensive labor dollars to manually swap VHS tapes? Did you temporarily “fix” your CCTV system with a DVR (digital video recorder)? Are you tired of having to purchase a system for four or eight cameras when you really only need 2 or 3? What if you could provide the authorities with the video footage that they need without anyone ever having to leave their desk? If you answered yes to any of the above, you have come to the right place! byRemote offers flexible digital network video storage solutions to fit any budget! Off-Site Hosted Video Storage. All that is needed are IP network cameras and a broadband connection to the Internet. The video is transported over the Internet and is recorded to the byRemote servers located in a remote secure data center. This solution offers added security by safely storing the digital video out of harm’s way from fire or smoke damage, water damage, theft, vandalism or deceit. A customer account may have multiple users. Each user can access their live or recorded video at any time by logging on with their unique username and password. On-Site Video Recording. Following the success of the Off-Site Hosted Video Storage Solution with its management features, we have added the byRemote remote Managed Video Surveillance Services for on-site video recording solutions. This is where an on-site computer is used to record the network surveillance video. We call this our Managed Video as a Service product. It ensures that your on-site network video surveillance system is functioning at its top performance. Off-Site Hosted Video Storage. 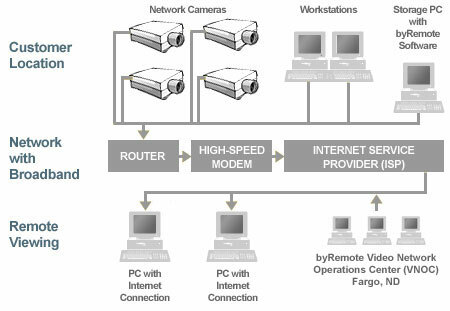 A customer provided, remotely located secure server with the byRemote Surveillance Center web-based camera management software installed on it, is used to store the video from multipler locations. The server can be located in a customer provided co-location or data center, or in the data center where the byRemote servers are located. With this solution, businesses with multiple locations or network shared storage can take advantage of having one system to maintain the video from any cameras connected to the Internet or WAN (wide area network).